This trio of dresses was inspired by a Modes Royale 1956-1957 Fall/Winter design. I love the description of this dress- "Scooped and contoured is the direction of this skirt planned to arch out at sides and glide at back." View A is made out of black casa satin. I love this satin because it is not too shiny or flimsy. It would also look beautiful in a print. The sash and straps are tied slightly different than they are in the Modes Royal picture. I will add pictures of the sash tied like the original picture at a future time. Madra looks stunning in her new "Hutton" wig. Originally I was only going to make the dress just like I saw it in the picture. But then I remembered the beautiful embroidered chiffon fabrics that I had bought a long time ago in Seattle. So I created a View B. View B has a full skirt and gives the dress another great look. 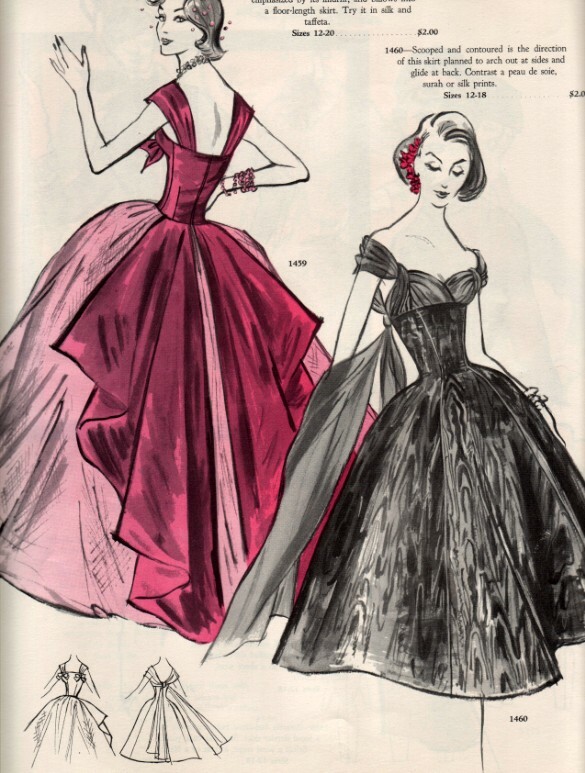 The black chiffon is silk. I prefer silk chiffon over polyester because it drapes better. I used polyester chiffon for this dress though because my white silk chiffon is more of a cream than a true white. Then I had to try the design in lace. Just when I thought I was done, I started wondering what the design would look like as a sheath. View C was made from embroidered chiffon. But wait!! That is not all! I think I want to make a View D now. It will be made out of a cotton print. I will add the photos and instructions after I make it. To purchase this pattern click here. Oh My Heck! I Got a "Grey Lady"